Identify and celebrate one teacher per year as the New York State Teacher of the Year who will represent all of New York State teachers at events throughout the State and at national events with Teachers of the Year from across the United States. The New York State Board of Regents announced on September 18, 2018 that Alhassan Susso has been named the 2019 New York State Teacher of the Year. Susso is a high school social studies teacher at International Community High School in the Bronx. 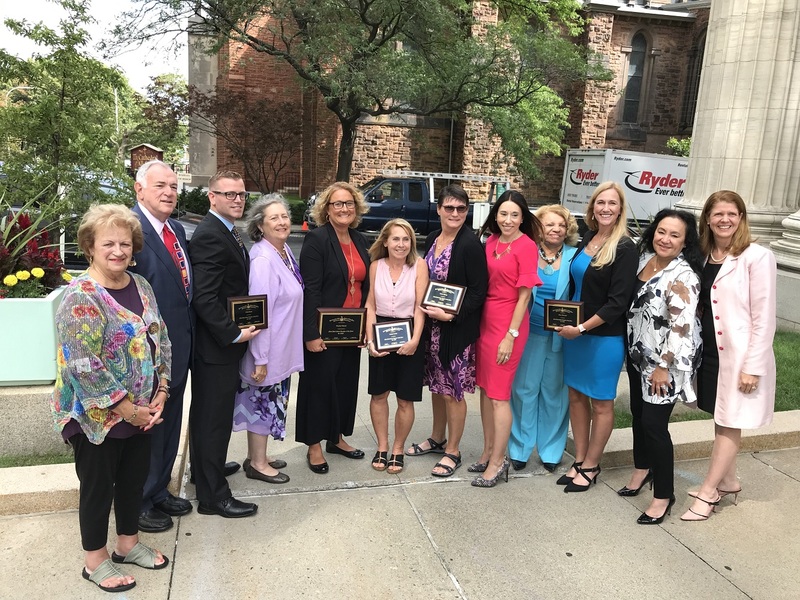 Pictured above, NYSUT Vice President Jolene T. DiBrango, Rachel Mural (2019 finalist), William Green (2019 finalist), Regents Chancellor Betty A. Rosa, 2019 Teacher of the Year Alhassan Susso, 2018 Teacher of the Year Christopher Albrecht, 2015 Teacher of the Year Charlie Giglio, 2016 Teacher of the Year Dana McDonough, NYSED Commissioner MaryEllen Elia, 2005 Teacher of the Year Elizabeth Day and 2017 Teacher of the Year Amy Hysick. A teacher may be initially nominated by any person within the school or community including parents, students, business leaders, school administrators, or colleagues using the nomination form. The formal nomination should involve a collaborative decision-making process indicating the support of all the groups concerned with the quality of teaching within a school. A complete application including letters of support is submitted for each nominee. Support from the school community may include approximately 30 days of release time to fulfill the obligations of the Teacher of the Year. The individuals selected to serve as State Teachers of the Year will be the ambassadors for the teaching profession across New York State and will lead by their passion for teaching. "Being selected as New York's Teacher of the Year is not only an honor but also a responsibility to represent and speak on behalf of the excellent teachers across the state." New York State (NYS) wishes to recognize and celebrate an exceptionally skilled and passionate educator to be an ambassador for NYS teachers and to serve as the NYS nominee for the National Teacher of the Year Program. The New York State Teachers of the Year and/or their schools are supported by New York State United Teachers (NYSUT), New York State Congress of Parents and Teachers, Inc. (NYS PTA), New York State Association for Supervision & Curriculum Development (NYSASCD), the Council of Chief State School Officers (CCSSO), Voya Financial, the SMART Technologies, and Educational Testing Service (ETS). The New York State Teacher of the Year Program, now in its 49th year, is administered by the New York State Education Department. It is affiliated with the National Teacher of the Year program administered through the Council of Chief State School Officers and sponsored by leading education associations. Teacher of the Year is the oldest and most prestigious teacher recognition activity in the nation.